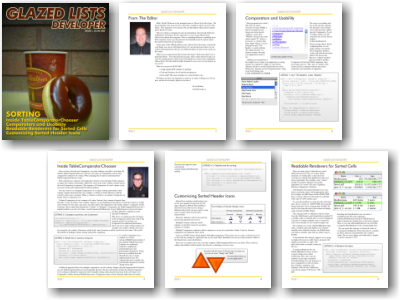 In the spirit of the O'Reilly Hacks series, Glazed Lists Developer is about the cool things you can do with Glazed Lists. It's our Google Labs where we can explore and experiment with our own APIs and share our discoveries with you, the reader. Copyright © 2005 publicobject.com, All rights reserved.